Tracking a vanished civilization across the american southwest. The word "vanish" cannot be used without a sense of irony. Vanishing is a magic trick, a slight of hand. Nothing ever truly disappears. There is always a ghost of movement, a twig broken on the ground, a path leading away. There was once a Neolithic civilization in the Southwest, a culture of celestial monuments and networks of roads. According to common belief, the people vanished around the 13th century A.D. The larger civilization vanished, but the culture did not. This book is the flash of motion you see from the corner of your eye, the dart of a vanished civilization. I am looking behind the magic trick and finding a story far more elaborate and driving than the "mysterious disappearance of the Anasazi." 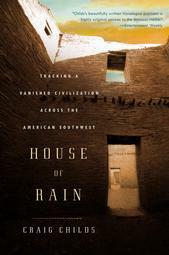 LA Times: "You can open to almost any page in 'House of Rain' and find an evocative line of prose. Every object is active and vivid..."
Powells Books: "Craig Childs has written a cracking good history disguised as an adventure! The book is filled with physical adventure on an Indiana Jones scale and scholarly detection worthy of Sherlock Holmes. The mystery of the Anasazi has intrigued historians for decades and Childs takes the strands of his research and others to weave a theory of the vanished civilization." Booklist: "The book is finally not so much about what happened to the Anasazi as it is about our own fascination with lost civilizations." "An original, eloquent account of an intellectual and archaeological odyssey. "Naturalist and NPR commentator Childs chronicles his research trips following in the footsteps of a native population that flourished, then mysteriously disappeared, in pre-Columbian America. "His subject: the Anasazi, ancestors of today's Hopi. These Southwestern hunters and farmers lived in some of North America's most unforgiving terrain, blisteringly hot and dauntingly arid, yet they developed a rich culture that survived hundreds of years and multiple migrations. The author travels along those migratory routes, pursuing the Anasazi over a period of years with many different companions, including his wife, infant son and stepfather, as well as various archaeologists and a few modern-day desert-rats. He battles fire, infernal summer temperatures, brutal winter cold and wind. Water tends to be either absent or overabundant; at one point, he allows a flash flood to transport him, sans clothes, downstream to his destination. He begins at Chaco Canyon in northwest New Mexico and meanders through Colorado, Utah, Arizona and northwest Mexico, where his quest ends in a recently plowed field choked with potsherds hundreds of years old. The author has interviewed (and frequently traveled with) numerous authorities on the pottery, geology, architecture and agriculture of these enigmatic people. His text is rich in geographical and archaeological detail about raising corn, breeding macaws, beheading turkeys and more. Childs considers conventional thinking, then weighs in with his own theories, earned the old-fashioned way, by walking tough terrain to sites untouched for centuries. Evoking these places where people ground corn, procreated, celebrated and slaughtered one another, he displays surpassing curiosity and profound reverence."